In San Francisco, New York and Chicago, support contingents for Pfc. 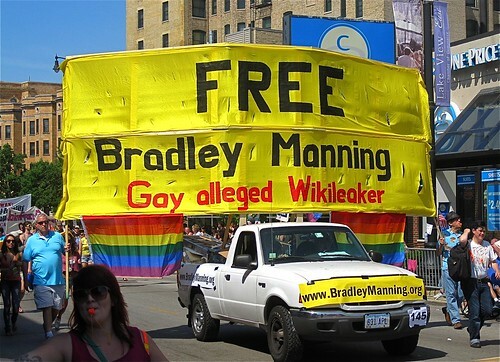 Bradley Manning, the accused WikiLeaks whistleblower, participated in Sunday’s gay pride parades. Those who marched in contingents aimed to make the LGBT community more aware of Bradley Manning. The pride parade in Chicago was one of the first major events for the Chicago chapter of Bradley Manning supporters. Here in Chicago, activists are confronting the fact that many do not know of Manning. The past twenty four hours saw some big stories related to WikiLeaks break. -The Grand Jury investigation into WikiLeaks widened as news subpoenas were issued to individuals like David House, co-founder of the Bradley Manning Support Network. -The US government's case against Thomas Drake totally imploded. He accepted a misdemeanor plea deal and will likely serve no jail time primarily because the government did not want to make its case against Drake with information on classified technology. I had Trevor Timm, the person behind the @WLLegal Twitter account, record a podcast to talk about these recent WikiLeaks-related stories. Marcy Wheeler, guest on the podcast this week, gets into this saying, "If you agree that bringing down speech is a legitimate cyber warfare tactic and if you agree that WikiLeaks was an attack on defense infrastructure or maybe State Department infrastructure, then you can easily get to the justification of okay we can do a DDOS attack on WikiLeaks," and finds the US government may be working to create legal justification for such attacks. Wheeler blogs at Firedoglake as Emptywheel. She primarily covers the national security establishment in the United States and has written many blog posts on WikiLeaks, Bradley Manning and cyber security, with her most recent post on all of this being, "The Cyberwar Campaign against Jihadi Literature and WikiLeaks." The Bradley Manning Support Network will be having a rally to support Bradley Manning at Leavenworth tomorrow. I interviewed Jeff Paterson, who is with Courage to Resist and serves on the Bradley Manning Support Network Steering Committee. Paterson discusses Manning's transfer to Leavenworth saying it "came about only because more than a half million people took action" through protests, letters, singing songs directly to the president etc. And, it was a victory that ended the "torturous conditions" he was being subjected to at Quantico. Paterson also deconstructs recent portrayals of Manning in films produced by PBS and The Guardian. The Dawn Media Group in partnership with WikiLeaks has been releasing the "Pakistan Papers." Thus far, some of the revelations include the following: US was concerned that Pakistan would oppose its policies at the United Nations; US was worried Pakistan would purchase oil from Iran, allowing them to get a foothold in Pakistan; Pakistan's government was upset with US funding for the Pakistan military, which led to increased civil-military tensions; Pakistan's military asked for continued drone coverage; the US has had troops deployed on Pakistan soil; Saudi Arabia and the UAE have been financing jihadist groups in Pakistan and the US did not provide Benazir Bhutto with proper security. For this episode of "This Week in WikiLeaks," the show has part two of an interview that was done with Raza Rumi, a writer based in Lahore, Pakistan. Rumi regularly writes for the Pakistani weekly The Friday Times, The News and Daily DAWN on myriad topics such as history, arts, literature and society. Rumi has worked in Pakistan and abroad in various organizations including multilateral institutions such as the United Nations. Rumi's writing can be read here. To hear the show, click play on this embedded player. The Dawn Media Group in partnership with WikiLeaks has been releasing the "Pakistan Papers." Thus far, some of the revelations include the following: Pakistan's military asked for continued drone coverage, the US has had troops deployed on Pakistan soil, Saudi Arabia and the UAE have been financing jihadist groups in Pakistan and the US did not provide Benazir Bhutto with proper security. For this episode of "This Week in WikiLeaks," Raza Rumi, a writer based in Lahore, Pakistan, joins us. He regularly writes for the Pakistani weekly The Friday Times, The News and Daily DAWN on myriad topics such as history, arts, literature and society. Rumi has worked in Pakistan and abroad in various organizations including multilateral institutions such as the United Nations. His day job comprises working as a policy adviser and development practitioner. As a policy expert, Raza works with international development institutions, government agencies and leading Pakistani NGOs. He is also an adviser to an Asia Pacific governance network and serves on the editorial board of Journal of Administration and Governance and contributes to various publications in Pakistan and abroad. For the past four or five days, a copy of a leaked confidentiality agreement from WikiLeaks has been a hot topic among those who follow news and politics. Those that have regularly scrutinized WikiLeaks, who have typically gone along with any meme in the media that shines a light on the organization’s imperfections, took the posting of this agreement as an opportunity to focus on how this showed complete hypocrisy. Those sympathetic and supportive, on the other hand, saw this as a moment when they needed to get out in front and defend the organization. As the story was breaking, I received a Twitter message, “WikiLeaks Threatens Its Own Leakers With $20 Million Penalty" http://bit.ly/klgAnz What says @kgosztola?” The message came from Roni Weiss, a personality on a podcast show called “Don’t Worry About the Government.” I told him he should have me on his program to share my opinion. On Facebook, we went back and forth on the “Don’t Worry About the Government” show page as I tried to get him to do a segment with me. He stated his position, “My biggest concern is that I just don't have much to say about it…My stance is basically: This looks bad for them, publicity-wise, and beyond that, I don't really care, because they do a lot of things that look bad. There are three high profile federal grand jury investigations. For each one, the argument could be made that the grand jury is chilling political action or seeking to criminalize people for associating with certain groups that are not charged with committing any crimes but instead are unsavory and illegitimate to the government. The investigations being referred to are the investigation into Anonymous that is based in San Jose, California, the investigation into antiwar and international solidarity activists that is based in Chicago, Illinois, and the investigation into WikiLeaks that is based in Alexandria, Virginia. Joining the "This Week in WikiLeaks" show this week is Jim Fennerty, who is a Chicago-based attorney defending the activists who were raided by the FBI in September of last year and now face a grand jury investigation. He is with the National Lawyers Guild and will be here to talk about his work defending the activists and will talk about the grand jury process and what those following the WikiLeaks might see happen in Alexandria as the investigation moves forward. This statement was posted by the Committee to Stop FBI Repression yesterday night. It is the latest on Hatem Abudayyeh, a Palestinian solidarity activist, who is one of twenty-three activists that has been subpoenaed to appear before a grand jury in Chicago. In a strange turn of events, the bank admitted announced today (May 10) that they shut down the accounts, stating they no longer want to provide banking services to the Abudayyeh family. Simultaneously, TCF management informed the Abudayyehs today that they were issuing them a check for the value of their accounts. Calls from across the United States ha an impact. A Code Pink activist from Washington, DC called US Attorney Patrick Fitzgerald's office and was told, "We've received hundreds of calls." The Office of Foreign Assets Control (OFAC) received numerous calls as well and "journalists from a National Public Radio affiliate, Al Jazeera and other agencies contacted them for an explanation." The family's attorney, Michael Deutsch, says, "In my opinion, the bank did not act out of the blue. I suspect that the FBI and U.S Attorney investigation caused the bank to overreact and illegally freeze the Abudayyehs’ banking accounts that had been there for over a decade." On May 4, Mr. Colangelo, a Senior attorney at US-based Dorsey and Whitney LLP, and a consultant with Human Rights Watch was bared entry into Bahrain. Authorities cited his need for a visa, because of the "kind of work" he does, although Colangelo has frequently travelled to the country on various business matters with no prior incident. In February, Mr. Colangelo spoke at a press conference at Bahrain Human Rights Society (BHRS) in Manama. Mr. Colangelo has also represented Bahraini who were Guantanamo detainees. HRW has released an 89-page report stating that Bahrain needs to take "urgent steps to end torture and ill-treatment of security suspects during interrogation. The report also called on the government to promptly investigate all torture allegations and prosecute security officials suspected of abusing detainees" (Source; Saudi News Today). Bahrain's ongoing crackdown has escalated since February, targeting every level of society with fewer and fewer outside observers allowed into the country. See WL Central's ongoing coverage of Bahrain: May, April, March 1 through 21, March 22 through 31, and February. I spoke last night EST with Mr. Colangelo, while he was on a stop over in Paris, en route back to the Unites States from Bahrain. Why were you going to Bahrain? I have been involved with issues concerning Bahrain for a number of years. It began with representing the Bahraini who were detained at Guantanamo, and more recently I have worked as a consultant with Human Rights Watch on domestic Bahrain issues. Update: Edited podcast is posted. The long-awaited release of the Guantanamo Files. More than 10,000 cables in the Cablegate release now posted—2000 of them from Canada and just out before the country's election. The Grand Jury beginning to issue subpoenas in its investigation of WikiLeaks. The media getting an out-of-the-ordinary tour of Ft. Leavenworth with the consent of the Department of Defense. There was much to talk about this week. With so much to discuss, Trevor Timm, the person behind the Twitter account @WLLegal, joined the program to talk about the latest news on WikiLeaks. Timm helped to make possible a great Personal Democracy Forum event called, “WikiLeaks & the Law" just over a month ago. [Go here for video of the full panel.] He also appeared on the show just over a month ago. Andy Worthington is a journalist, blogger, and author of The Guantánamo Files: The Stories of the 774 Detainees in America’s Illegal Prison. He is also co-director of a new documentary film, “Outside the Law: Stories from Guantánamo”. In 2009, Worthington revealed information about the demise of Ibn al-Shaykh al-Libi the former US 'ghost prisoner' whose alleged suicide death in a Libyan jail is still under suspicion. Ibn al-Shaykh al-Libi's testimony, which was obtained under torture and coercion, and later recanted, was cited by the George W. Bush Administration in the months preceding the 2003 invasion of Iraq as evidence of a connection between Saddam Hussein and al-Qaeda. The head of the Washington office of Human Rights Watch stated al-Libi was "Exhibit A" in hearings on the relationship between pre-Iraq War false intelligence and torture. Confirmation of al-Libi's location came two weeks prior to his death. Most recently, Worthington partnered with WikiLeaks on its latest release of thousands of pages of documents regarding the cases of 758 out of 779 Guantanamo detainees dating between 2002 and 2008. The documents consist of memoranda from JTF-GTMO, the Joint Task Force at Guantánamo Bay, to US Southern Command in Miami, Florida. You can find Mr. Worthington on his Web site or on twitter @GuantanamoAndy. I wanted to talk to you a little bit about a couple things that you had mentioned when you were talking with Amy Goodwin on Democracy Now. One of the things you talked about was that ‘guidelines’ needed to be set up for filtering or discriminating the content that was found in the documents. Could you tell me a little bit about what that would be like in terms of application? Well, you know, to be honest...a certain amount of hard work is required and some of that has already been done… I am glad to know…by some of the journalists who’ve been writing about it already...who have worked out that a lot of this supposed ‘body of evidence’ consists of allegations that have been made by a small number of prisoners… who have made repeated allegations against large numbers of their fellow prisoners, which have been called into doubt. Now, you know, the doubts about this information are not necessarily mentioned, in fact, they are rarely mentioned in these military documents. Jason Leopold is the deputy managing editor of Truthout.org and a co-founder of The Public Record. Leopold and his colleague, Jeffrey Kaye, have also investigated medical experiments at Guantanamo and psychological techniques used to design Bush's torture program. The tenth episode of "This Week in WikiLeaks" features Iraq war veteran Ethan McCord and Bradley Manning Support Network Steering Committee member Kevin Zeese. McCord and Zeese have both appeared on "This Week in WikiLeaks." They are part of this week's episode because I recorded them talking at an event in New York City organized by World Can't Wait to promote a new short documentary, "Incident in New Baghdad." Run time is about 1 hour for the episode. 2011-04-21 Interview with Terry Holdbrooks, former Guantanamo guard. This is our second interview in a series of interviews with former Guantanamo Bay detention camp guards and detainees. Several current and former U.S. soldiers have expressed interest in speaking publicly about their experience at Guantanamo: including a CIA psychologist, interrogators, guards, and medical personnel. They are disgusted with what they witnessed or took part in at Guantanamo, but declined my request for an interview, because they fear opening themselves up to prosecution by the US government, which required them to sign a Non Disclosure Agreement. I was also told that many are afraid of being prosecuted for war crimes, since low level soldiers are often the ones who shoulder the brunt of punishment and backlash; whereas higher ranking officials seem to escape scrutiny completely. Update: The edited podcast is posted along with a full transcript of Edward Fox of ColombiaReports.com's interview. The guest for this episode of "This Week in WikiLeaks" was Edward Fox, who is with Colombia Reports. He has been editing and organizing releases of the US State Embassy cables that deal with Colombia. On the show, we will talk about how the cables are impacting Colombia, what has been revealed and discuss some specific revelations concerning FARC, the US-based Drummond Coal corporation, the DAS wiretap scandal and, finally, the revelation that the US has been using drones in Colombia since 2006. Following the interview with Fox, the show wrapped with a brief look at the cables from Israel that are being released and what they are revealing. WL Central has covered what they show about Israeli officials’ views on Hamas in Gaza. There is much more to hone in on, as another aspect of the cables that deserves attention is fear and trepidation on Iran. The cables also appear to affirm some aspects of Al Jazeera English’s “Palestine Papers,” which gave the impression that the Palestinian Authority can be very deferential toward Israel and often take action that pretty much betrays the people of Palestine’s interests or well-being. Or, you can go to this page and click on episode on Colombia that appears in the CMN News list (it is likely the most recent one). Or, you can search for the episode on iTunes. Search for "CMN News" and it will appear to download. At the Left Forum in NYC, I spoke on a panel called "What Has WikiLeaks Revealed." 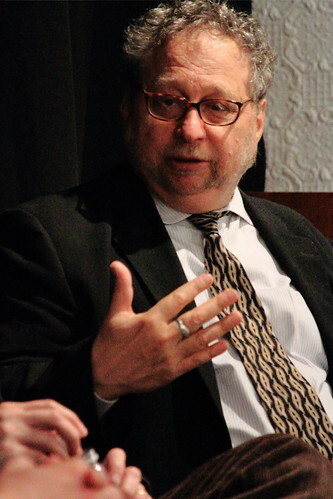 I presented with Danny Schechter, founder of MediaChannel, and someone who is a broadcast/print journalist and an internationally recognized speaker and writer on media issues. Schechter and I each gave a presentation. That audio will be posted at some point. But, for now, as I prepare for the National Conference for Media Reform 2011 that is being held in Boston from Friday, April 8th through Sunday, April 10th, I would like to share what Schechter had to say on US media, particularly US corporate media.